They’re not as transportable as a cordless, but a corded handheld vacuum will provide you with more consistent power and you won’t have to worry about it shutting down during your cleaning. Those reasons alone are enough to convince many people to choose the latter. You may also find helpful our Best Corded Handheld Vacuums Comparison Chart. Here are 5 of the best corded handheld vacuums around today. 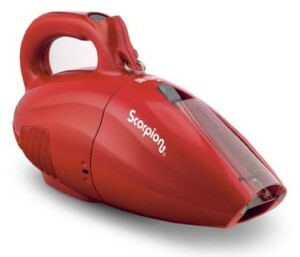 The Dirt Devil Scorpion (read full review here) is one of the most lightweight and compact handheld vacuum cleaners around, but despite its weight and dimensions, it packs power from the source of a 7 amp motor. The design, attachments and 16 foot long power cord allows you to reach into far reaching places and tight spaces / corners. The simple yet effective Quick Flip crevice tool is the trademark of the Dirt Devil Scorpion, one that users find one of the most ingenious and convenient design features on a handheld vacuum. 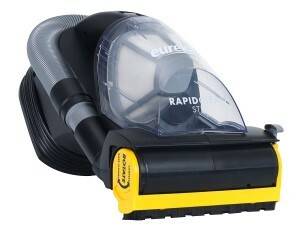 The Eureka RapidClean 41A (read full review here) is the newer version of the EasyClean 71B (shown above). It’s similar in body design but has a few notable differences. Instead of the Riser Visor, the RapidClean switches between On/Off Brushroll and a Bare Floor Brush to clean various types of surfaces. It has a very long power cord at 25 feet (opposed to 20 feet on the EasyClean), and a 3 foot stretch hose, which brings the combined reach of the RapidClean to 28 feet. This makes it one of the longest reaches for a handheld vacuum. 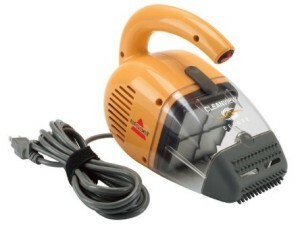 It’s slightly heavier than the EasyClean, but slightly more powerful with a 6 amp motor compared to 5.5 amps. While the RapidClean is a bit more powerful and has a longer reach, some consumers prefer the Riser Visor feature of the EasyClean. There really is no ‘better’ model, but rather it comes down to personal preference. One of Dirt Devil’s most recent handheld vacuum models is the Dirt Devil The Hand Vac 2.0 SD12000 (read full review here). 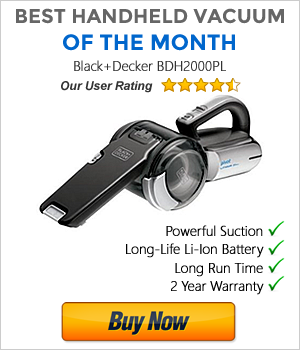 It currently stands as one of Amazon’s most highly rated handheld vacuums, and the reason being is because its users have emphasized its power abilities. It has a 20-foot long cord, which powers the motor-driven high speed brushroll, the cleaning head that keeps rolling through tough dirt and multi-sized debris. It has a quick rinse filter and one touch release for emptying the dirt container. 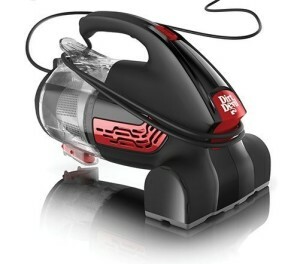 What you see is what you get with this handheld vacuum. It comes with no attachments, but if your primary concern is cleaning carpets, stairs and chairs in a quick and efficient manner, then the Dirt Devil The Hand Vac 2.0 is the perfect candidate. 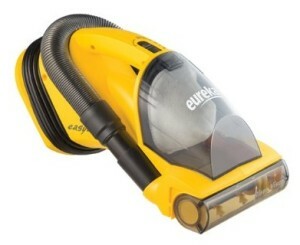 Once again, the Eureka EasyClean 71B (read full review here) makes it on another one of our lists of best handheld vacuums. There’s a reason why this is one of the bestselling handheld vacuums on Amazon. Like many high-rated handheld vacuums, this has a high suction power, owed to its double motor – One for powering its revolving brush and the other concentrated on suction. And the 20 foot cord is long enough to ensure that you can reach into far areas of your home. One of the best features is the innovative Riser Visor, designed for cleaning carpeted stairs more effectively. It does this by use a clear plastic cover that stays down on a horizontal surface, and flips up when cleaning a vertical surface, allowing the revolving brush to do its job. This mechanism essentially makes cleaning stairs quick and easy. The Shark Rocket Ultralight Upright HV302 is by far the most powerful and versatile corded handheld vacuum on this list, and perhaps even on the marketplace. Powered by a 30 foot cord and 500 watts motor, the HV302 can be used as an upright vacuum with its wand attachment, or just as a handheld. It includes a motorized brush roll for cleaning carpets and a ‘dust away’ attachment kit for cleaning hard floors. Also included are tools for cleaning vehicles, computers and other tight areas. There’s even a wall mount to save you space and provide extra convenience. The below models were previously featured on this list but because of newer and better models entering the picture, they’ve been pushed out. By no means are they no longer good, so you may still want to check them out. The BISSELL Cleanview Deluxe has the exact same design as their Pet model, but the difference being is the Cleanview Deluxe is specialized in general cleaning, has a longer power cord at 18 feet long, and has a slightly more powerful suction. The attachments it comes with makes cleaning stairs, upholstery and carpets throughout your home a breeze. These include a rubber contour nozzle, a 2 foot hose, a wide mouth tool and a crevice tool. Its HEPA Media filter is a bonus as it will capture dust mites, pollen and tobacco smoke and transfer it into non-harmful air.